Asia’s population is rapidly aging. In fact it is the continent with the oldest average age and over the next 20 years the elderly population will double meaning that Asia’s aging demographics are a literal time bomb. Many economists describe this as Asia’s biggest challenge. The time is now for governments, not-for-profits and corporations to begin planning. Asia’s aging demographics will redefine all aspects of the continent. It will change healthcare, change economics, change cultures and change the future. Planning for an world where there are are more retirees than workers will take tough decisions and careful thought. Private and public stakeholders will have to work together to help re-imagine what the world will look like and how to best respond. 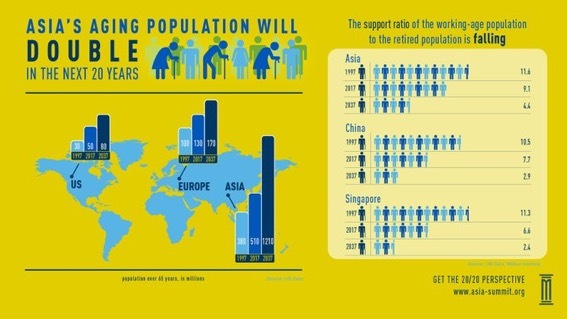 Asia’s Aging Demographics in one Infographic.